In a dual-homed network infrastructure, loopback interfaces are a very valuable configuration option on Palo Alto firewalls. 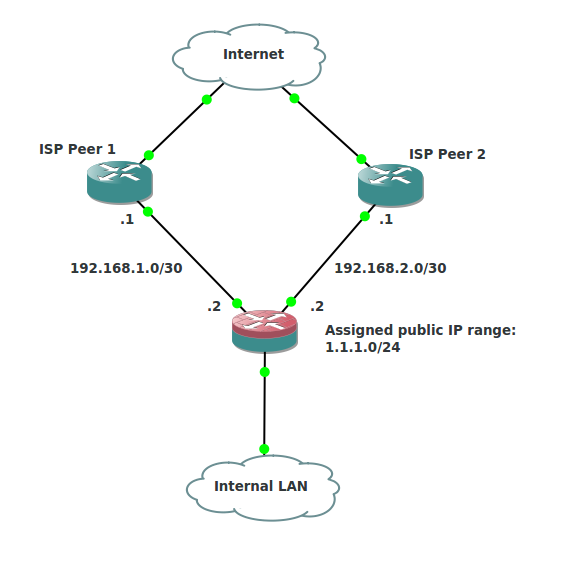 Cisco folk may be more familiar with the use of loopback interfaces, so this article gives a very quick look at some of the uses of a loopback interface in a Palo Alto firewall deployment. The most usedul scenario for explaining the use of loopback interfaces is either a ng routing setup, or a standard dual-homed implementation. We’ll explore the latter. The firewall has two interfaces: 192.168.1.2 and 192.168.1.2, and an assigned public IP range of 1.1.1.0/24. We’re already seen in previous blog posts (here) how to advertise the public IP range via BGP to only one ISP peer, and only advertise to the backup peer should the primary peer become unavailable. The next step is to setup the various firewall functions to support this setup with minimal configuration. The “typical” configuration of a palo alto firewall would involve an administrator binding several configuration items to a physical interface. For example, a NAT policy is normally set with an original destination interface being a physical interface and IP address. This sort of configuration does not scale well in the above scenario. An admin would have to have two NAT rules, one covering traffic coming in on the primary link, and another covering traffic coming in on the secondary link. In the case of a failover, the palo alto configuration does not change since all the above are configured on loopback interfaces. So long as the traffic has some physical path to the firewall, it will hit the loopback interface and be processed according to configured policies. You mean 192.168.1.2 and 192.168.2.2 right?